Beech trees, on a perfect autumn day. 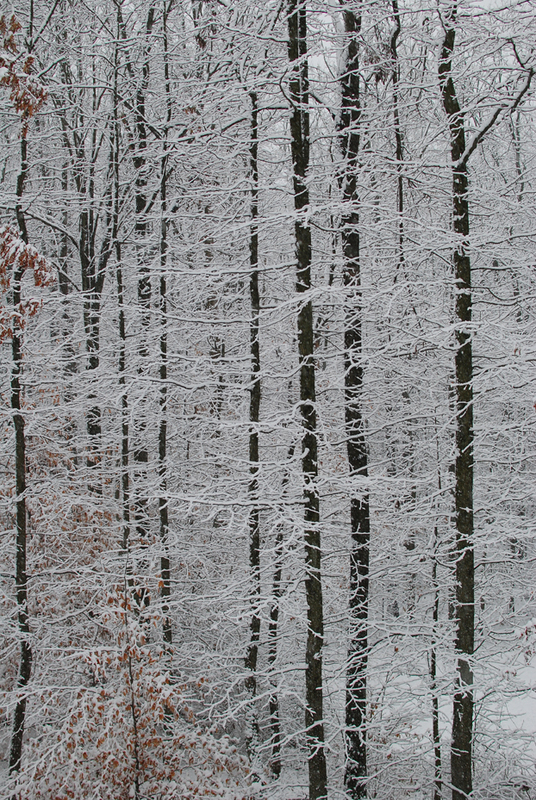 We awoke this morning to the first snowfall of the season. As I am writing this, it is still snowing with predicted accumulations of one to three inches. We have those amounts already, even though the weather forecasters mentioned the snow is supposed to continue through the day. Later today the snow is expected to turn to light rain and the temperatures should fall closer to freezing. Winter has arrived. I took these two shots looking out from our deck about 9:00 am this morning. Both photos were taken within seconds of each other, and from the same vantage point. I wanted to illustrate the difference between a vertical composition and a horizontal composition of the same subject. Some compositions work better in one format versus the other. That is why I almost always take a vertical shot after taking a horizontal. Neither version is correct or incorrect, but more of a personal preference. Due to the constraints within WordPress, click on the photos to see the full effect. I also over exposed each photograph by one stop. 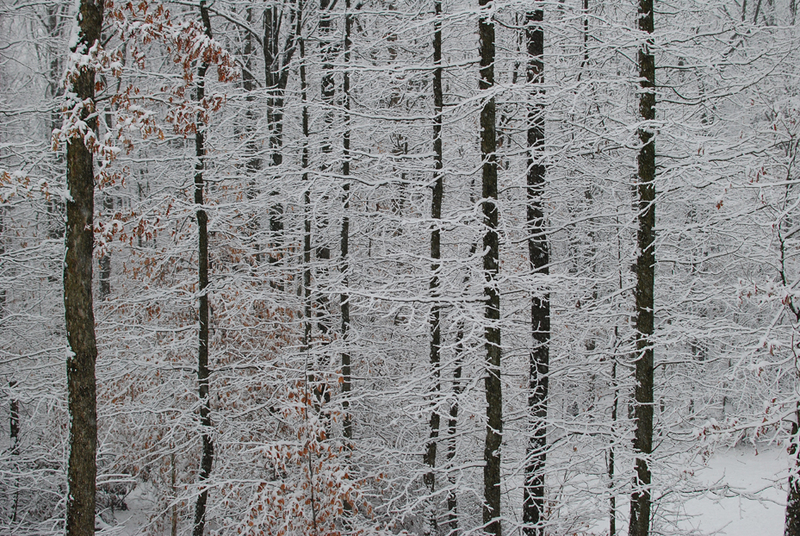 Had I followed what the exposure meter recommended, the snow would appear grey rather than white. I probably could have over-exposed the shots by an additional stop to brighten the snow even more, but then I would have lost detail in the tree trunks. Photography can be full of compromises. Photo specs are, ISO 200, White Balance-cloudy, f3.5, @ 1/200th, manual mode. IN THE FIELD: I Met A Celebrity! I was visiting my favorite greenhouse and garden center the other day with the intention of adding to my floral photograph collection. The abundance and variety there keeps me occupied for several hours. Before I take any photos, I like to wander around a bit to check out the direction of light and shadows and look for possible compositions. The place is so big I have to take notes and draw a map so I don’t forget where I saw particular plants of interest. The business is well known in the horticultural arena, and draws people from all over the countryside. While orienting myself to get back to the front of the main greenhouse, I literally bumped into a celebrity named Martha. She was such a sweetheart and was kind enough to allow me to take her portrait. Oh, her last name is Washington. 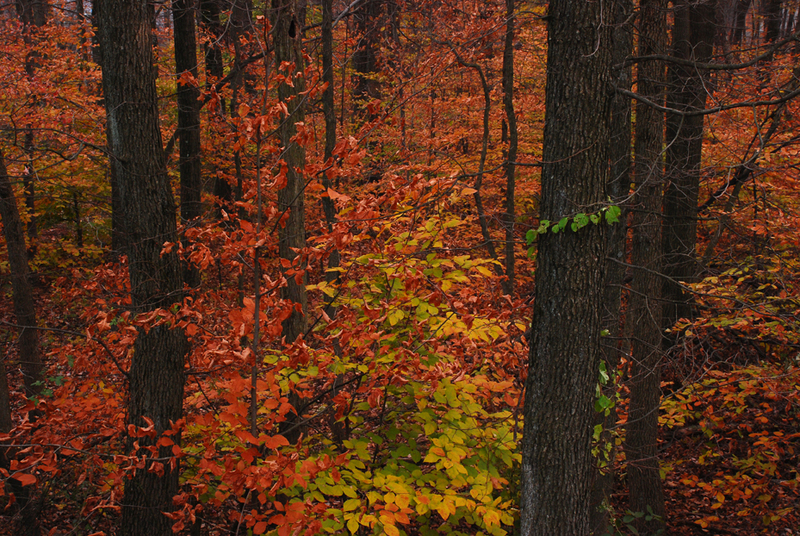 After I finished some yard work on Saturday, I got out the camera to capture some of the autumn color that remains in our woods. The sun was dipping below the horizon, but there was still enough ambient light to get some shots without using the built-in flash or a speedlight. And I knew this was a situation which would call for longer exposure times and the use of a tripod. One of the advantages of long exposures is colors can become more saturated than what you may find with shorter exposure times. I was also fortunate there wasn’t even a wisp of a breeze, so everything in the photos was sharp. To start this exercise, I bumped the ISO to 400, set the aperture at f11 for good depth of field, and adjusted the shutter speed to 2.5 seconds for a proper exposure. I could have used a faster shutter speed, but that would have dictated the use of a wider aperture. Which in turn leads to less depth of field. I also used an electronic cable release to further minimize camera movement. Some folks might say it was too dark to get a decent photo. I say phooey. The light sensitivity built into cameras these days is remarkable to say the least. My camera, which is at least four years old, had no problem making a proper exposure or auto-focusing. The newer models are even more capable. Low light photography can be a challenge for your equipment or for yourself, but the rewards are worth it. Least in my humble opinion. A few days ago, I happened upon this weathered steel door at the back of an old building. 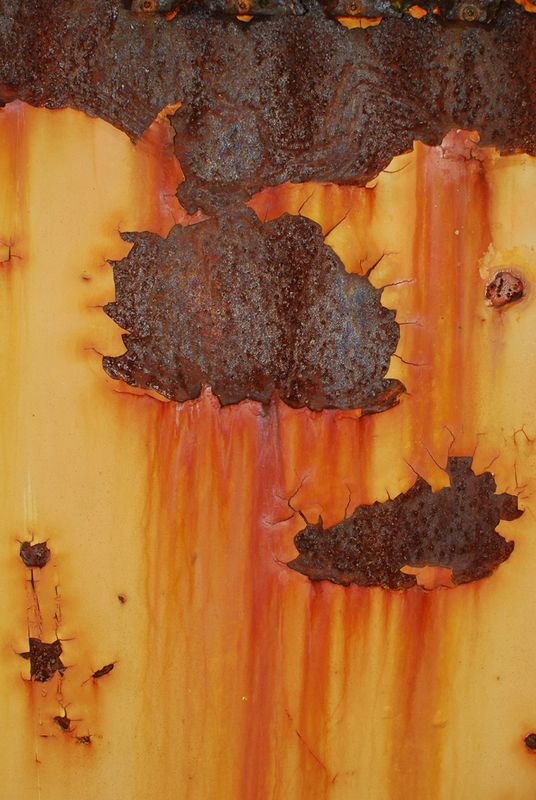 I liked the contrast of textures between the smoothness of the peeling and rust-streaked paint against the patina of the rust. I wasn’t on a particular quest, mission, or assignment…I took this shot for the pure pleasure of it. Back in August I wrote a post about one of our Limelight Hydrangea bushes that was struggling to stay alive during the summer heat wave. After some nurturing from us and much needed rain, it bounced back with full vim and vigor. 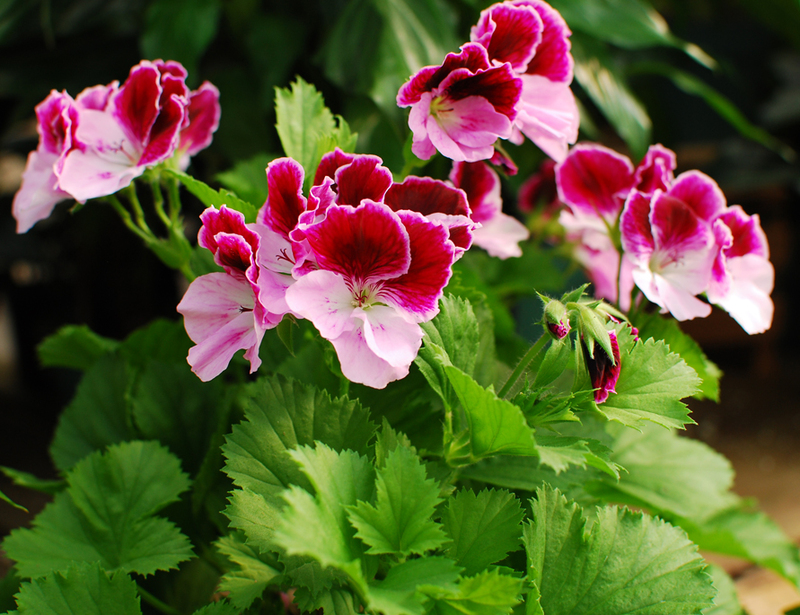 When these flowers first open in late spring, the flower petals are pale green. Later in the summer, they change to a creamy white. 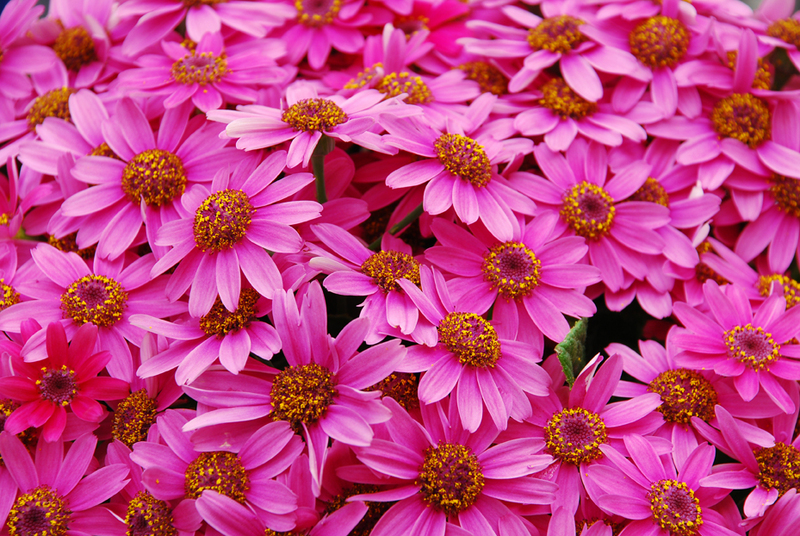 And in the autumn season, the flowers turn a vivid pinkish tone, then fade to a light tan as the colder weather approaches. These are wonderful shrubs for the landscape and offer four season appeal. They do grow quickly but are easily managed, by trimming them back in the spring. 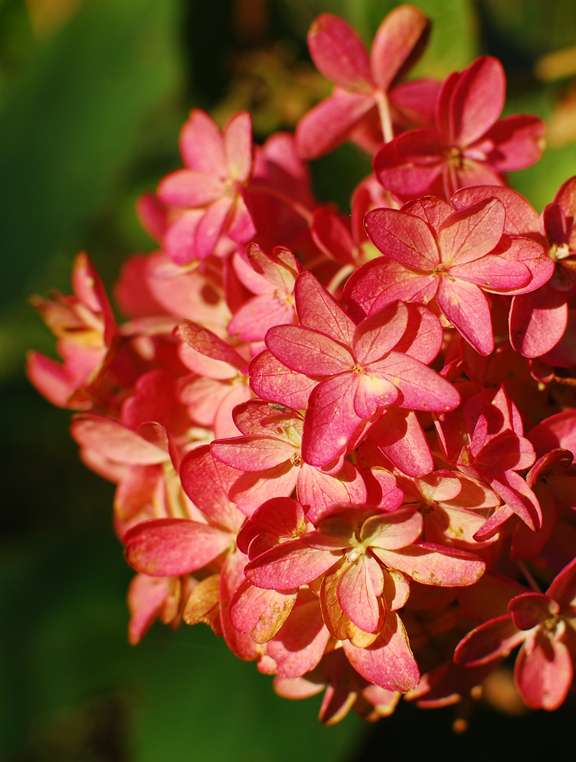 The flower heads are quite resilient to heavy weather and most of them will remain on the bushes throughout the winter. Rather than trim off the flower heads after they dry, we like leave them on the bush for some winter visual interest. I took this photo late in the morning a few weeks ago. I used a tripod, electronic cable release, and the camera settings were f5.6 @ 1/125th.